On Christmas Eve and Christmas Day the joy of the season, the magic of the season, the decorations, the trees, the family, and the gifts of the season will come to a high point for most families. There will be food, reunions, music, and presents. Afterward, children will ride new bikes, play new video games, and text their friends to report on their Christmas loot. By the time January rolls around, those same children will have forgotten many of the gifts, but they will return to school and complete essays and reports on how Christmas vacation was spent. Most will start off those reports with, “I got this or that for Christmas,” or perhaps, “We had ham, and cake and grandma came.” With all that will happen in the next couple of days, it is sometimes easy, even for Christians, to forget that at the center of all the celebrations is a small baby and the worship and praise bestowed upon that baby for his birth into the world. The first Christmas was very different than the ones we celebrate today. There was no Santa Clause, no gift giving among friends, no cakes, pudding, and family visiting. There were no bright lights and snowmen. There was initially only a baby in the manager. There was wise men, or magi, in the east who had studied the stars and knew that a new king was being born, but they would not arrive until sometime after the birth. The fact is, on that wonderful night that we now celebrate as Christmas, there were no gifts. It was a much different kind of Christmas for those who ended up celebrating. Imagine being one of the angels in Heaven for just a moment. You know that God himself is about to enter the world he has created. You know that after hundreds of years of messages carried, enlightenment given to the inspired words that would predict Jesus’ arrival that at this very moment Jesus was in fact being born. Those angels must have been bursting with the desire to spread the news. If angels sit in Heaven, or have a starting point, they must have all been on the edge of their seats or right on the mark waiting for the word to go. Can you imagine them leaning forward, pushing against the line like runners waiting for the starting gun to go? In Heaven, the celebration was in full swing. They knew what was happening and they had waited for it, perhaps even rehearsed and prepared, or maybe they just knew what they would do. Whatever the case, they wanted to praise God, celebrate Jesus, and share with the world their love and devotion to the new king. Finally, at long last, maybe it was the moment that Jesus first drew his breath, the word was given from above and the angels were told…”Go”. The angels then raced into the world and told the first people they found about Jesus. They found shepherds in a field. These shepherds were hard at work, dirty, tired, poor, and working to get by when all at once the worshiping of the angels started. The angels had arrived, and they were ready to get the party started. They were not bringing trees or pudding, no Santa in a red suit. No, these angels were worshiping God, praising his son, announcing the arrival and celebrating. 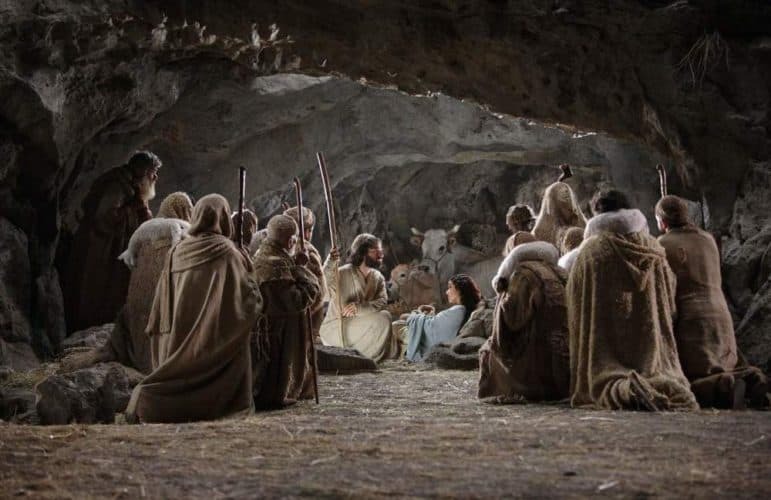 So powerful was the moment, that the shepherds dropped everything they were doing and rushed to see the new king. When the shepherds arrived and saw Jesus, they worshiped him, they glorified him, and they celebrated him. Afterwards, those same shepherds went out and told everyone they knew about the new king. They continued to worship him and celebrate him and to spread the world just as the angels had done. That first Christmas was very different from the one we celebrate today. While the politically correct will attempt to take Christ out of Christmas, the fact is they can never do it. Christmas is not about the wrapped presents under a tree, it’s not about a man in a red suit, it’s not about candy, and cakes, and pudding, no Christmas is much more. Christmas is about the one Savior of the world. Christmas is about the worship and celebration of Jesus Christ and his arrival in this world. The event would affect millions of people, promote thousands of books, and the news would spread around the world. It all started with angels wanting to worship, shepherds coming just as they were to worship, and even the rich bowing down to worship the king. Arguably the entire story took place over a year or two, but it had been prepared for since the beginning of time. So, during your Christmas celebrations on the Christmas Eve or Christmas Day, enjoy the day. Spend time with loved ones, remember Christmas of the past, eat, give gifts and celebrate. It’s a wonderful time of the year and you should enjoy it. But maybe, at some point you can take a break from those modern celebrations and step back to the first Christmas for a moment, and in that moment, you can worship and celebrate the baby in the manager coming into this world as the first gift for our salvation.